← Class Opener – Day 68 – Some Special Squares? All 3 of my classes have a quiz today. And with a half-day of school today due to parent conferences at the elementary level, there’s just no time for a class opener in any of my classes today. But wait…there must be something I can share with you all! This week’s freshman class offered a number of great activities which provided much-needed practice, along with team building and class-vs-class trash talk. 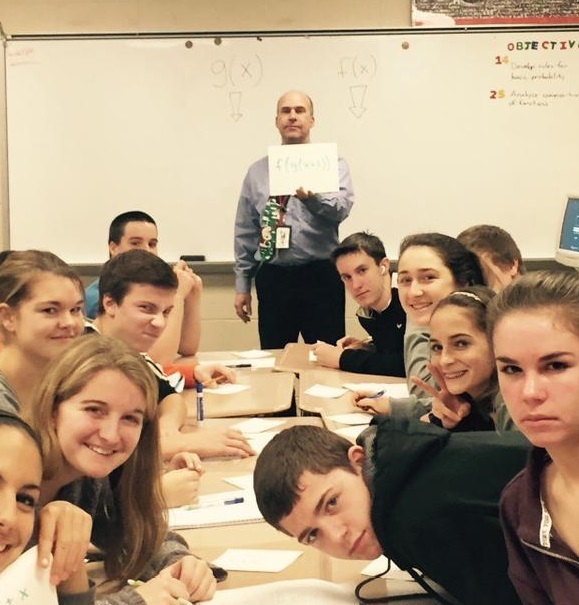 This week’s unit focused on functions: specifically, operations with functions , inverses and domain/range. To set up this activity, students ripped apart my classroom, moving desks into two long rows, with tables facing each other. Then, each student took a card, which offered an expression, such as “2x+5”, “x^2+2”, “-3x+1”. Students on one side of the table were assigned the role of f(x), while the other side of the table was g(x). This was written on the board at the end of the long table so students could remember. Partnerships reached an agreement on their answer, and I encouraged pairs to write down any problems which caused trouble so we could review them later. After each question, all student rose from their chairs, and moved one chair over in a clock-wise direction, which ensured that students worked with a host of different partners and functions. The entire activity took about 30 minutes, and was a fun review for our quiz today. Take the questions and their answers, cut them all apart, seprating question from answers. Place them in a baggie to store. Shake up the baggie. My students sit in groups, so each group was given a handful of the slips of paper. Project a stopwatch on the screen. Have the class select a class captain. When I say go (and start the stopwatch), the goal for the class is to match up all 25 functions with their inverses. I give no rules for how they need to organize this, other than that the problems need to be in order, as I have left the question numbers with the original problems. The class which completes the task quickest wins class snack. This week, my morning class completed the task in over 12 minutes. My afternoon class was a bit more organized from the jump and took only 10. The teamwork and whole-class participation was exactly what I was looking for! The questions I used this week are given below. Enjoy!